Sold by A4Tech - Bloody and Fulfilled by Amazon. Gift-wrap available. ►Tap into the future with LK Libra, with the fastest key response and true 1:1 raw input, now with added per-key stabilization bar for precision handling. Continuous optical beam delivers zero-latency and contact-free engineering for up to 66.6% more durability than mechanical switches. Calibrated Precision, 1.5mm Actuation, Less Key Chatter. ►Optical sensors are completely digital, freeing them from mechanical failures (metal friction, liquid spills, or oxidization) and to be actuated with extreme precision. Nanocoating water resistant barrier and drainage holes ensure you're never out of the fight when accidents happen. ►Weapons-grade anodized aluminum design maintains a lightweight frame while eliminating smudges and fingerprints from your strenuous gaming sessions. Comes with Detachable ergonomic wrist-rest. 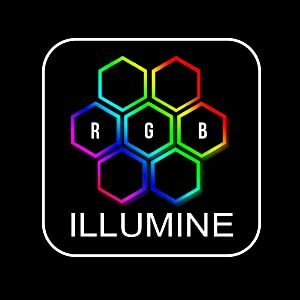 ►Illumine RGB Backlighting – LK Libra's new Prizm lens radiates vivid, clear RGB backlighting that won't distract you from your gaming sessions. Choose your battle colors for per-key backlighting and represent your squad, guild, or clan. ►Left Num-Pad Design - Keep your mouse close and your enemies closer. 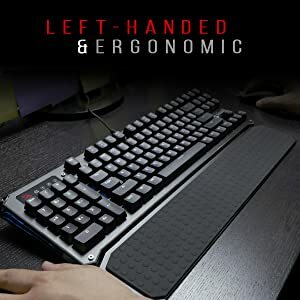 Left-handed ergonomic design provides gamers additional keys within reach for crucial bindings and macros, while reducing long-term shoulder strain with a more neutral mouse and keyboard placement. 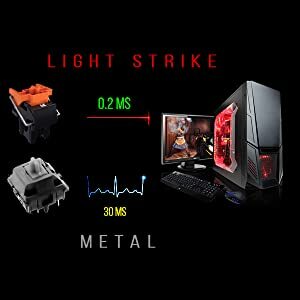 Gamers and eSports pros count on Light Strike (LK) to help shave crucial milliseconds of latency, making all the difference between victory and defeat on the competitive stage. Light Strike optical switches focus on speed, giving pros a definitive advantage by truly being one step ahead of their opponent when the game is on the line. Keep your mouse close and your enemies closer. 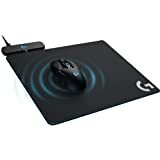 Left-handed ergonomic design provides gamers additional keys within reach for crucial bindings and macros, while reducing long-term shoulder strain with a more neutral mouse and keyboard placement. Detachable ergonomic wrist-rest was engineered to deliver total comfort and its ability to quickly stow away for portability. 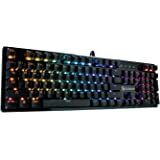 All Light Strike Keyboards use a nano-coating layer that is highly resistant to spills, splashes, and spouses. In extreme cases you can you can pop the switches out individually for more thorough cleaning (ex. sodas, sugary drinks). You know that moment, the one where you’re seconds away from losing. You feel your finger pressing the game saving key, but it’s too late. The key didn’t register. No matter how many times you tell yourself, it keeps running over in your head, “I know I pressed it”. Maybe you're not crazy. This is called input lag, it’s caused by mechanical switches and their metal to metal contact designing. This lag can be anywhere between 8-30ms; have you checked what you’re gaming on? Libra's new Prizm lens radiates vivid, clear RGB backlighting that won't distract you from your gaming sessions. 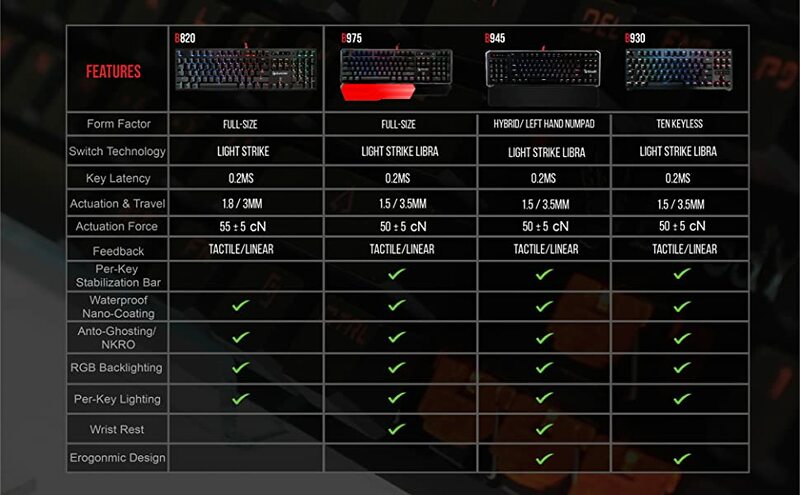 Choose from over 16.8 million colors for per-key backlighting. Reinforces all keys with a stabilizing bar for tighter control and a premium, uniform key feel. The improved, calculated shallow stroke increases the reactive return rate of keys, eliminating wasted key travel and finger fatigue. 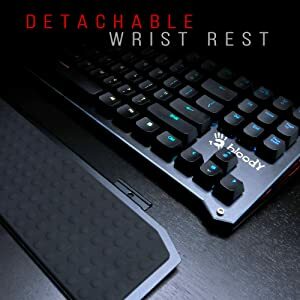 A reinforced space bar with balancing rail and double springs helps maintain accuracy and durability while all keys provide the satisfying feel gamers have come to know and love. Ultimate Gaming Gear. Built For You. ​​LK Libra comes in three different sizes to fit your needs. Full-size standard set, a ten-keyless for portability and tournament play, and a unique left-hand hybrid design for ergonomics and accessibility to bindings. 5.0 out of 5 starsIt’s a bloody good keyboard, I couldn’t be happier. 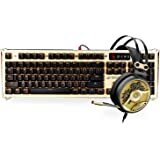 Bloody is a relatively new, certainly lesser known name in comparison to the big names like Corsair, Razer and Logitech; but I’d argue that Bloody’s bloody good quality matches or maybe even tops the highest end keyboards from all of the aforementioned big names. To hit a home run even further, Bloody’s in-house optical keyswitches use lasers rather than traditional copper based metal switches. The difference isn’t exactly immediately noticeable, but in going back to my Razer Blackwidow; I could feel the difference was there. 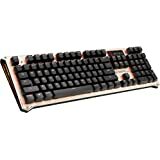 LinusTechTips once described the older version of this keyboard’s keyswitch speed as the difference between 144hz and 240hz monitors; the difference is there, but it’s not nearly as pronounced as the difference between 30hz to 60hz, or even 60hz to 120hz. And if you’ve gotten used to 240hz (in this case, Bloody’s optical keyswitches), 144hz just feels off and a little strange (traditional Cherry MX keys). If you’ve seen the pictures of the optical keyswitches, you’ve probably noticed they look pretty strange. I myself was wondering whether or not a (normal) custom keycap set would work with them – and let me answer that question: they will. The keycaps themselves, and the little ‘+’ that slots the keycap onto the switch, are identical to the keycaps of other mechanical keyboards. 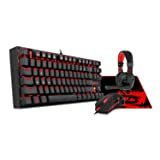 As a bonus, Bloody includes in the box TWO sets of extra keys for Q,W,E,R,A,S,D,F (the gamer layout) and even a little keycap puller tool. 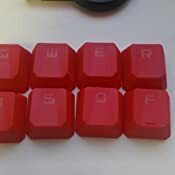 One set is clear with black text and similar plastic to the normal keycaps, the other is red with a noticeable slightly rubbery feel and an indent similar to what Logitech puts on some of their gamer-oriented keyboards. Strangely, each type of keycap has a different font; which is certainly interesting. 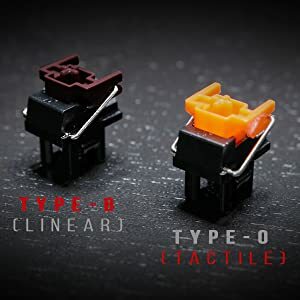 While personally I’m not a fan of the strange keycap shape, I really appreciate that Bloody includes them with the keyboard; I bet quite a few people would be very happy to have them. I have no room to complain here, but I would have liked an extra set of keycaps for the arrow keys; though you can easily use any third-party set if you care about it that much (I certainly don’t). My keyboard is the “orange switch” model which is described as “tactile and clicky”. If you’re a fan of MX-blues, I think you’ll be happy here. If you’re a fan of Razer’s Razer Green keyswitches, I think you’ll be even happier. I was very, very surprised with how similar the switches felt and sound to my Blackwidow. I can’t speak on behalf of the “brown switch” model, but I really, really love how these switches feel. 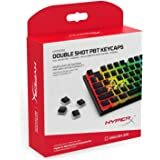 Before buying, I was worried I wouldn’t like how they felt; a problem I had when testing other keyboards with Cherry MX-Reds, Browns and even Speeds. At least to me, these switches feel as fast as the speeds, as tactile and clicky as blues, without being quite as loud (though they are still plenty loud, which I like). As for the rest of the keyboard, it feels very high quality. Bloody states that they use a “weapons-grade anodized aluminum” and I certainly believe that they do. 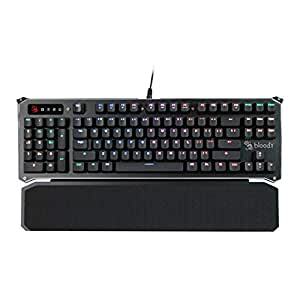 I felt very little if any keyboard flex with a reasonable amount of force given to it, and I truly believe this keyboard could hold up to a lot of abuse. The plastic in the keycaps is very nice, I have no complaints about the feel of any part of this keyboard. As for design; unlike older models, Bloody has dialed back a bit on the gamer aesthetic. If the corners were in a perfect rectangle and not the hexagon/octagon-esque shape and the lights on the sides of the keyboard turned off, I don’t think anyone would give the keyboard a second glance in an office environment. With that said, I’m glad they didn’t give up on the gamer aesthetic altogether; I like my keyboards to have a little bit of flair without going overboard. The hexagon/octagon-eqsue corners are very subtle and don’t affect my placement of the keyboard at all. 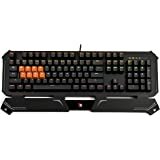 I’m especially fond of the lights on the side of the keyboard which read “Light Strike Gaming Keyboard”, while the words aren’t customizable; the lights behind the text are! 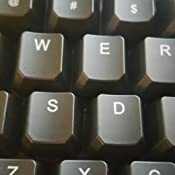 The little feet on the rear of the keyboard, for those who choose to use them, are very rubbery and do not slip at all on my desk. Nor do the pads on the bottom (as I don’t typically use the feet). 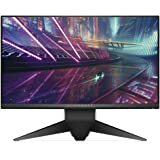 This brings me to the software and LED customizability, which isn’t perfect, but is very easy to use and I personally found the tool just as easy to use as Razer’s Chroma configurator. I use a 4K monitor, and it would seem that Bloody’s “KeyDominator2” software has a little bit of a scaling issue, but it’s minor and I imagine wouldn’t be difficult to fix in a future update. With that said, like any keyboard configurator you’ll likely only use it once in a great while; so the scaling issue I experienced is extremely minor in the grand scheme of things. I’m not entirely sure how capable the software is to do really advanced animations and the like – but I was able to recreate my custom keyboard animation that I had on my Blackwidow in about 10 minutes; I’m very happy here. If macros are your thing, I don’t think you’ll have any trouble making those either. There are two ways to change the LED effects on the keyboard; FN + F12 cycles through 6 defined/preloaded animations, and FN + any of the number keys can pick a specific animation you have defined/preloaded. Custom animations you make can be saved directly to the keyboard and used on another computer without installing any specific drivers or extra software. 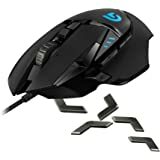 When I plugged in the keyboard for the very first time, it was on and ready to go seemingly instantaneously without needing to install a driver; much like how a lot of Logitech products are. The last thing that I want to touch on is the packaging that the keyboard comes in. Soft but sturdy white foam surrounds the keyboard inside the box and the keyboard is wrapped in bubble wrap in the middle. It would take a lot of effort to damage this keyboard in shipping, and the extra effort Bloody put into assuring the keyboard would be safe makes me respect Bloody just that much more. The box is also quite sturdy, easy to open and I would recommend hanging on to it if you ever intend to travel with your keyboard. I mention this only because the packaging for my Blackwidow was really bad in comparison. I really, really love this keyboard and I don’t think my money could have been better spent elsewhere. Bloody, I really hope you keep up the good work and make more gems like you have here. I’m very happy, and I think this keyboard will serve me for a very long time. I’m going to have to look into making the ‘optical’ switch to a Bloody mouse. 5.0 out of 5 starsThe AK-47 of the Keyboard world! 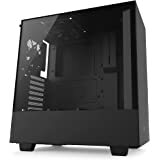 - The RGB, Macro hybrid software isn't the most user friendly and it isn't the most super detailed software in the industry, but they get the job done, be it a bit clumsily. - Do not lube or tinker with the switches. If you need to wash them off, you honestly should just use compressed air. Unlike Cherry MX, these switches won't die from dust. So IMO you should treat these like scissor switches. Spam compressed air on them and you should be fine. The switches are hilariously smooth to begin with and lubbing them doesn't make a notceable difference besides "removing" the click (as mine is the tactile and clicky one), and the tactile bump. So just like scissor switches, just leave 'em alone. 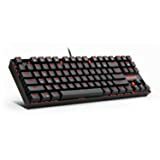 - Due to the low overall travel of these keys, while this makes them fast and responsive for gaming, for typing, expect to miss type a lot when you use these keyboards for the first couple of weeks. Again with the scissor switch comparisons. - Due to the low overall travel, except to bottom out often. I recommend buying thick o-rings so you don't tire your fingers out in less than 2 hours. They don't make it a night or day difference or anything, but the o-rings help just enough that the effects are noticeable enough for it to be a viable upgrade. 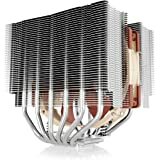 - The RGB isn't super full. The bottom is slightly less lit than the top, as the top of the switch housing is where the light shines through. - Speaking of the RGB, the color options from the software isn't 1:1 with what is shown on the board. White looks ever so slightly pink, bright yellow looks like a subdued yellow, etc. But it works well enough that it gets the job done. + HYPER durable! I've had a couple heavy objects accidentally fall onto my B975 keyboard here and there, but it works as smoothly as it did day one! Not just the board, but the switches too! 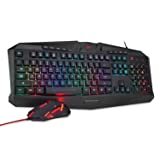 Its amazing that these are roughly the same price as other "premium gaming keyboards" but then those "other" keyboards die from a hand full of dust. Not even scissor switches die from that. 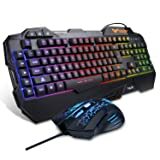 So this keyboard DESERVES the price it asks for. + The smoothness of the switches are unreal! No binding here! I've even learned on accident, that you can actually hit the key caps from THE SIDE, and it is smooth and stabilized enough that it will STILL actuate! By all means, these are extremely reliable and live up to the durability claims of Bloody. + INDIVIDUAL switches are potentially hot swappable for other LK Libra switches! 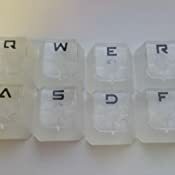 If someday Bloody sells their optical switches individually, you could hypothetically have some keys be linear, while simultaneously having other keys be tactile & clicky! + Speaking of the click, it isn't as loud as say, Buckling Springs, but it is noticeable. Basically Cherry MX Blues, but unlike CMX Blues, these don't rattle, aren't scratchy as hell, and are actually reliable for gaming! Pretty much just overall better CMX Blues essentially. 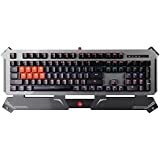 Which makes it absolutely tragic that there are plenty of keyboards with Cherry MX Blues in them that cost MORE than this keyboard! + Plus mounts on the switches! Got some nice PBT keycaps with plus mounts on them? They will work on these keyboards! 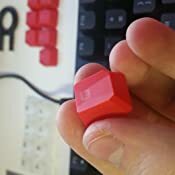 No need for "specialist" keycaps because one company decided to make some uncommon mount to force you to buy THEIR own keycaps. Nope, none of that here! What keycaps you would use on a Cherry MX board will work here! + NKRO! I like to play both osu!-Standard and 9-key-osu!-Mania. This keyboard won't miss a beat! That will be because of the user, and not because of this keyboard! + BTW, this keyboard is absolutely baller for osu!. No missed inputs, and no "phantom" inputs that I didn't actually do. Btw, the ladder is what ghosting ACTUALLY is, is when inputs happen but the user didn't actually press anything. Though, none of that so far with this keyboard! + INSANE potential switch life! Know about Hall Effect switches? These are in that plane of durability. 100 million is actually a conservative estimate, and just like Hall Effect switches, these could easily hit the BILLIONS of actuations without fail! So hypothetically, this keyboard could outlive you and be passed down to the next generation. With how durable it is, if you take care of it, I reckon you'd be able to do so easily! = Besides the durability, it is pretty "average" when it comes down to it. The RBG back lighting, though fluid, the lights themselves aren't the absolute best or worst in the industry. They're average. Same goes for the macro software. Again, the clicky switches are no buckling springs as far as clickiness is concerned, but they do still have a presence . The tactile bump isn't super pronounced, but is still noticeable, more so with o-rings. Not to mention, as reliable as this keyboard is, at the end of the day it is just that, a keyboard that just so happens to be hyper reliable. When I said it was the AK-47 of the keyboard world I wasn't joking. There are by all means more flashy options on the market, but if you want legitimately reliable equipment that won't die from a gust of dust and water go Bloody. = The keyboard isn't super user friendly to take apart. 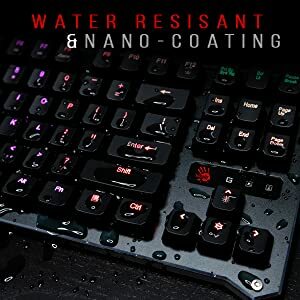 Again, use compressed air, and the dust will actually go through the water channels on this keyboard and blow straight outta those water holes on the bottom of the keyboard. I called this a double edged sword since, for all intents and purposes, it isn't technically a problem in the grand scheme of things but is still a point to take note of. = There's only two switch options (as far as LK LIBRA's are concerned anyway). It is a quality over quantity type of situation here. With quantity being Cherry MX. So while it may be under whelming to have only two switch options (as of this review), do note that, they blow anything Cherry has right now, cleanly out of the water. Besides, unlike Cherry's, this keyboard can deal with literal water to begin with! = Non-detachable braided USB cable. I use this only for desk usage. For traveling purposes, I wouldn't recommended it because people are barbarians with their equipment, and because that cable isn't replaceable (easily at least), not a super great idea. Unless you actually use your equipment non-abusively, in which case, go right ahead! Even though I have the full sized B975 model, It is pretty light!